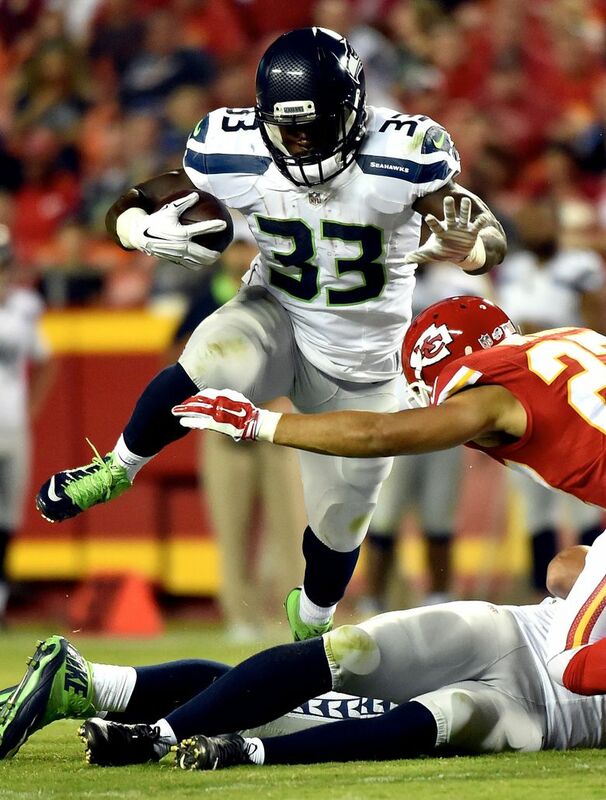 The Seattle Seahawks on Wednesday re-signed Christine Michael to the team's 53-man roster. The Seattle Seahawks turned to a familiar face Wednesday to bolster their suddenly depleted running back corps — Christine Michael. As he prepared for the initial practice of his second stint with the team, though, Michael said he hopes to be a different player than the one the Seahawks saw the first time around. And whether he can make good on that goal could be the difference in whether this is a short reunion between Michael and the Seahawks or possibly something more. The team’s second-round pick in 2013 out of Texas A&M, Michael was traded before the season to Dallas for a seventh-round pick after being surpassed on the depth chart by rookie Thomas Rawls. The Seahawks were always enamored with Michael’s physical gifts but grew frustrated with his inconsistent approach to his job. When Seattle coaches first inquired with Michael this week about possibly helping now fill in for Rawls — who is out for the season with a broken ankle suffered Sunday at Baltimore — they wanted to assess if his mindset was appropriate for the task. Seattle offensive line coach and run game coordinator Tom Cable said early returns were encouraging. Michael’s career, though, has mostly been going in reverse the last few months. He entered the 2015 training camp still regarded as a possible heir apparent to Marshawn Lynch after having played sparingly in 2013 and 2014 (254 yards on 52 carries). But a shaky preseason in which he had 118 yards on 32 carries compared to Rawls’ 158 on 30, while also losing a fumble, helped lead to the team’s decision to trade him. Michael then played in just five games with Dallas, gaining 51 yards, before being released. After going unclaimed, he then signed to Washington’s practice squad on Nov.19. Washington released him Tuesday and he then signed with the Seahawks, who need depth in the backfield as they are also still without Lynch as he recovers from abdominal surgery on Nov. 25. Seattle coach Pete Carroll said Wednesday that the signing of Michael was not a sign that they are skeptical about when Lynch will be back, but said the timetable for Lynch’s return remains unclear. As for why re-signing Michael and not any of the other running backs out there? Carroll said with just a few weeks left in the season, there is great value in finding someone who already knows the offense and team. Michael, meanwhile, said the course of this season has forced him to face some hard realities. “It is a humbling experience and I just have to evaluate myself and do things right and come in with a good mindset and come in focused like these other guys are and come in here and do work,’’ said Michael. Michael didn’t argue the thought that doing things as expected on an every day basis was what helped lead to his departure from Seattle. Any hard feelings over his trade, he said, are gone. Cable said Michael will compete with Bryce Brown, who was re-signed on Tuesday, and Derrick Coleman this week in practice for the right to get carries on Sunday against Cleveland with Fred Jackson sticking with his role of being primarily a third-down back. Cable said ideally that the team will “lean on’’ two of the three against the Browns. Cable said Coleman, who has been primarily a fullback in his Seahawks’ career, will be a legitimate factor in the equation due in part to having been with the team all season. Coleman has 25 yards on five carries in his Seattle career but rushed for 1,840 at UCLA. Michael’s hoping to show the Seahawks this time that he can, too.